Every four years, brands have the chance to celebrate the world's largest sports happening by connecting with engaged consumers and athletes. Olympic events are watched by millions of people worldwide, so it's also an opportunity to give attention to innovations in communication and consumer behavior. London 2012 marked the first Olympics to embrace social and video. Any person could relate to the Games through social networks or YouTube while major TV and online channels live-streamed events. Four years later in Rio, the trends revolved around the proliferation of smartphones and apps as a means to consume content. As Search Engine Land points out, more than 50 percent of global online searches is now done through a mobile device—and Folha de S. Paulo notes that Brazil's smartphone population (up to 168 million now) continues to see growth. As a result of this massive adoption, people from all over followed the Games on the go, through mobile streaming services and TV network apps (SporTV Play, BBC Sports app), but especially through social apps like Snapchat and Instagram. Both became the new live-streamers of Olympics, enhancing the user experience with athlete interactions and glimpses behind the scenes. Social app adoption is not limited to sharing and consuming content—many apps designed for utility now include social and sharing opportunities. Here at Waze, a social GPS app adopted by more than 65 million users worldwide, we were able to perceive and measure the impact of the three-week Games period, not only on traffic, but also on businesses. Our data shows that both tourists and locals were in town for the Games. During the Games period, there was an impressive amount of navigation (37 percent) from other states and cities—and, among those who came from outside Rio, the Paulistas (people born in Sao Paulo) navigated to the most venues. The country who led in medals also led in navigation. Among all international visitors, US drivers led by far in the number of navigations in Rio during August. Although Rio offered public transportation to Olympic facilities, many Wazers still needed to drive. The Waze Map Editor network helped Waze to become the most up-to-date traffic platform during the Games. Prior to August, editors added nearly 45,000 places, and updated or added nearly 3,000 road segments. From July 31 to August 21, they made more than 50,000 additions to the map, and drivers reported more than 250,000 traffic jams and more than 7,000 accidents. Among those who decided to drive with Waze, the most popular venue was The Maria Lenk Aquatics Center, which hosted water polo, synchronized swimming, and diving competitions. 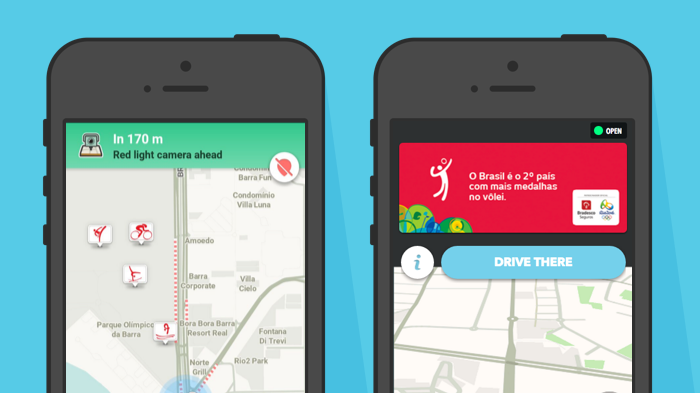 Waze also confirmed that Rio was bustling late into the night with lots of celebrations. Waze app usage spiked from midnight to 5:00 a.m., showing how lively Rio's nightlife was compared to the period before the Games. 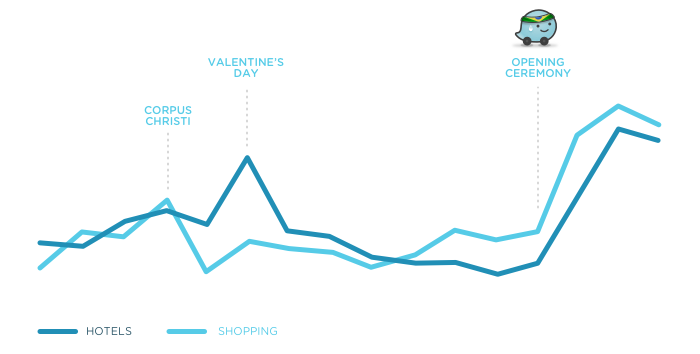 This chart shows the variation of Waze app usage throughout the days prior and during the Games. It compares the hourly weight of one period against the other. Overall you see a consistent increase happening from 10:00 PM to 5:00 AM. The highest increase in usage happened at 1:00 AM. 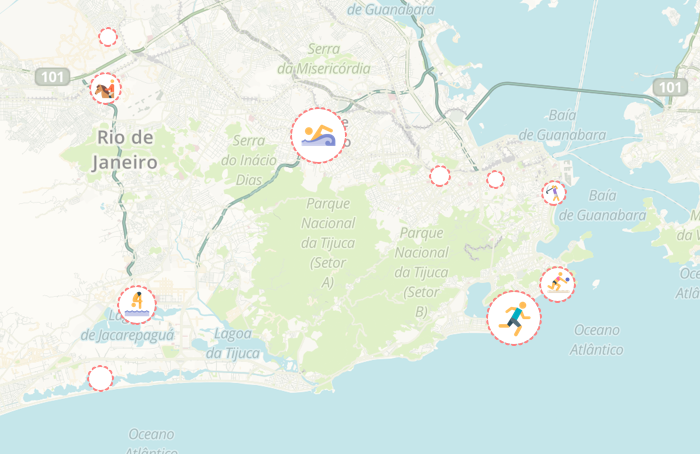 Rio received more than 1 million visitors, according to O Globo, and Waze data shows a big peak in navigations to hotels, shopping malls, and local businesses after the beginning of the Games. It's interesting to see that the navigations to hotels increased by 40 percent when compared to the previous holiday, Corpus Christi, in May. Local commerce visits surpassed those during Valentine's Day season in June. Brands also played a role in helping visitors and Cariocas navigate during the busy three weeks of the Games. Bradesco Seguros, a Brazilian insurance company, took advantage of each user's context and location to provide relevant sports trivia to attendees on the go. AdvertisingAge highlighted the partnership with Waze as one of the most creative campaigns in town. The campaign employed 38 different creatives, one for each of the sports. Every time a Waze user drove by an arena, the appropriate sport ad would pop up. The Olympics also present a great opportunity to build brand awareness in the host country—and that's what Visa, another global sponsor, did with Zero-Speed Takeover. If the Games have the power to amass consumer behavior data at a scale that allows us to identify and confirm trends in communications and marketing, brands should start looking ahead—imagine the innovations in store for Tokyo 2020! The only way to know where things are going is to fully understand where they've been. A good first step is to work with a platform like Waze, where you can leverage valuable consumer data and gain insights you can apply to future marketing plans.